Sardines are a staple on the islands and enjoyed with equal enthusiasm in their many forms: fresh, dried, or canned. For this recipe, sardines packed in tomato sauce are the key ingredient and can easily be substituted with fresh sardines and fresh tomato sauce when either is in season. Misua noodles are specific to Filipino cuisine and will definitely warrant a trip to the Asian market. They are fragile, superfine wheat noodles that cook in a matter of seconds. Once cooked, they have a silky, melt-in-your-mouth texture unlike any other noodle. 1. Heat the olive oil in a medium pot over medium heat. Add the garlic, the white part of the green onion (scallion), and the tomato. Cook and stir for 2 to 3 minutes until the tomato begins to soften. 2. 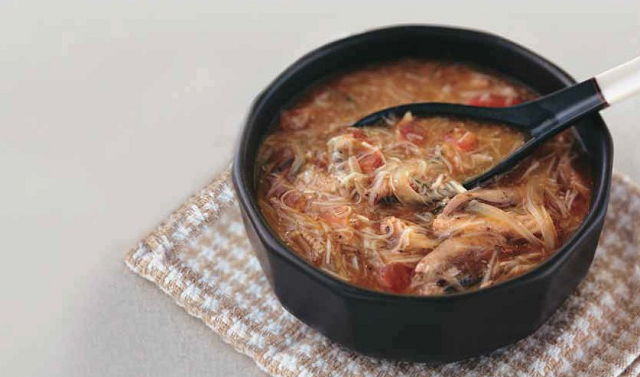 Add the canned sardines with the tomato sauce and chicken stock. Simmer the soup for 5 minutes. 3. Add the misua noodles, fish sauce, and pepper. Simmer for another 5 minutes until the noodles soften and the soup thickens. 4. Ladle the soup into bowls and garnish with the chopped green spring onion (scallion).